When Hollywood legend Marilyn Monroe famously sang, “Diamonds are a girl's best friend” it’s as if she predicted the great love affair between the precious gem and famous ladies of Hollywood! This week at Diamond Boutique we wonder if Ms. Monroe praised peridots instead – would we be seeing a gorgeous apple green hue on celebrity ring fingers everywhere? Take a look below and discover the underdog of the gemstone family as we envision iconic celebrity rings in peridots. Blake Lively and husband Ryan Reynolds shocked the world when they suddenly got married in 2012. Her engagement ring designed by celebrity jeweller Lorraine Schwartz, features a large, flawless, light pink oval diamond. Set in delicate rose gold and surrounded with pavé diamonds – this is truly a gorgeous ring! Look at how beautifully the passionate hue of the peridot centre stone complements the warm glow of the rose gold setting. The apple green colour makes the oval cut of the stone much more defined and eye-catching. Former “American Idol” winner Kelly Clarkson was quick to flaunt her massive engagement ring during the holiday season of 2012. 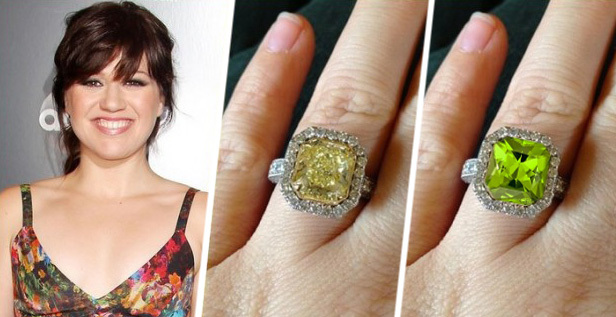 Her ring designed by Jonathon Arndt, features a canary yellow diamond with a of halo diamonds around it. Further diamonds run along the white gold shoulders of this show-stopping piece! Set in a halo of diamonds the peridot centre stone dances with brilliance and fire. The contrast between the peridot and the white diamonds steal your attention in one glance. We love the peridot version of this massive ring! The following ring took a whole year to design! Hollywood heartthrob Brad Pitt alongside his private jeweller Robert Procop designed this stunning ring for Angelina Jolie. Her engagement ring features an array of emerald and square cut diamonds, the centre stone being a table cut 7 carat diamond! 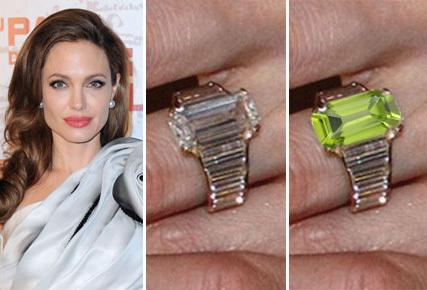 When we compared Angelina’s unique design highlighted with a peridot centre stone to its original, we were left astonished. The centre stone really twinkles amongst the diamonds, the contrast of the cool hues defiantly brings out the design more. With a peridot replacing the diamond, this vintage styled ring is now second to none. The light hue of peridot dances beautifully with the deep hue of the emeralds. The duo of green gemstones perfectly matched to her eyes, truly embrace our hearts. Famously known for her character Rachel in the series Friends, our next lucky lady is none other than Jennifer Anniston. This week she tied the knot with her fiancé and we’re excited to see the wedding ring that will accompany her glorious engagement ring. Jennifer’s ring is a staggering 8 carat radiant cut diamond set on classic yellow gold! One look at Jen’s ring with a peridot centre stone leaves us speechless. The divine green hue is utterly captivating; a completely different feel to the original diamond. The peridot looks extra luxurious with the yellow gold setting. Poppy Delevinge is owner to one of the most beautiful bespoke rings we have ever seen. This boho inspired piece designed by Leo De Vroomen features a wide style with a blue centre and heart-shaped side stones. An array of diamonds spread across the yellow gold settings provides further oomph to this divine ring. Poppy’s bespoke ring looks exquisite with a peridot in the centre, unlike the blue centre stone the peridot is not lost in the design. The green gemstone partners magically with yellow gold settings and white diamonds. 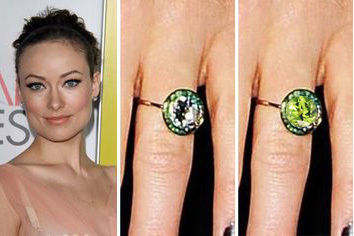 Now you’ve seen iconic celebrity engagement rings envisioned in peridot. We’re sure you’ll agree—they’re even more spectacular and definitely worth considering for your ring! To read our previous peridot blog, click here.